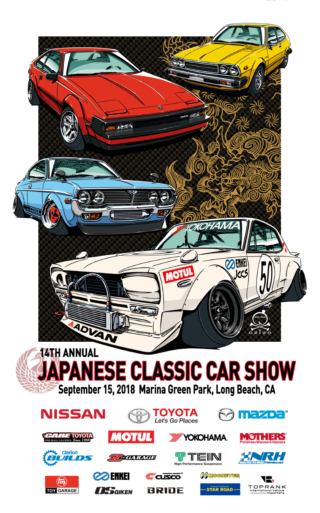 The 2018 Japanese Classic Car Show is just two days away, and we are excited for what promises to be a new era for the country’s premier gathering of Nihon steel. After 13 years at the Queen Mary, the JCCS moves to a new location this year, Marina Green Park in Long Beach, California, in order to better accommodate show cars and spectators alike. We at JNC have some exciting things happening at our booth. We will have some never-before seen Hot Wheels castings on display, and there will be some special surprises for a few lucky fans. Author and legend of automotive journalism Sam Mitani will be autographing copies of his debut novel, The Prototype. And, we will debut our latest shirt, Vintage Barrels Zero, a revisiting of our original design from 2010. Please stop by the JNC booth this Saturday, September 15. The show goes from 9:00 am to 3:00 pm. For reference, this is the same location as Toyotafest the last couple of years. Hopefully, the new location will solve many of the problems with spectators finding parking. See you there! Should be an awesome show (as always). Be careful. The cars are great at this show, but the people who run it are very, very unpleasant. My car and I won’t ever go back, and will stick to events with a more friendly culture. Good luck to anyone who attends – you are going to need it. I will stick to Toyotafest and Radwood where the organizers are nice. Well that’s interesting Anthony P Raimondo. The same organization puts on Toyotafest and JCCS. Really makes me question the validity of your comment(s). Different individuals with different attitudes. Treated very differently at each. You are entitled to your experience, I am entitled to mine. I’ve been to two of these shows – best shows ever! Hmmm. That’s odd. I find people that run the show very pleasant, and they run it well. One of the few shows that is family friendly. So many shows are run like car meets, so you get the rowdy street crowd, that you wouldn’t want to bring your kids. It’s the same people that put on Toyotafest, so it’s the same atmosphere. Not sure what happened to you, but I’ve always had nothing but a great time at these shows. It seems maybe a mirror is needed. I’ve been attending Nissanjam, Toyotafest, and JCCS for years. 99.9% of the people are very nice and helpful. Busy yes, as it is a stressful rush of activity putting on these shows. These shows have gotten better and better over the years. Their are higher standards to enter your car as well. 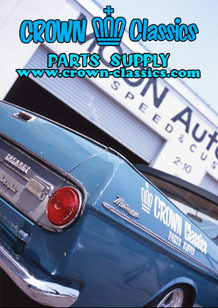 As popularity has risen, and the number of people that want to enter their cars has also risen, the organizers have to pick and choose which cars can enter. Variety, popularity and of course quality has to be taken into consideration. There is also a space limitation. Now if you are not picked or they decide not to accept your car, you can take it several ways. Go back and make the car nicer, get pissed and throw a fit, or ask politely for advice from others with more experience. If you are the “participation trophy” type, then you will not be met with much sympathy from this crowd. Head off to your local cars and coffee. As with art, your masterpiece may not be liked the masses. So, time to reflect! Or have a meltdown like a snowflake. You have no idea what you are talking about. I was treated poorly by a particular person, which is why I excluded Toyotafest, where I had a good experience. Of course, anyone who speaks of “participation trophies” and “snowflakes” is a person not worth much at all.